This concert was broadcast live on radio. My wife and I keep tickets of all events and concerts worthwile to remember in large jars on a cupboard in our living room. Hundreds of souvenirs are in there. And I was pretty certain tickets of the concert could be found in there. And indeed. This morning plunged myself into a sea of tickets. And guess what I found! 500 Belgian francs for seats on the balcony. About 12,35 EUR or 14 USD now. A wonderful souvenir of a wonderful concert! I attended this concert and it still is a great memory. The show or part of it was transmitted on Belgian/Flemish BRT Radio 2 + an interview with Joni. Both are in the VRT Radio Archives. 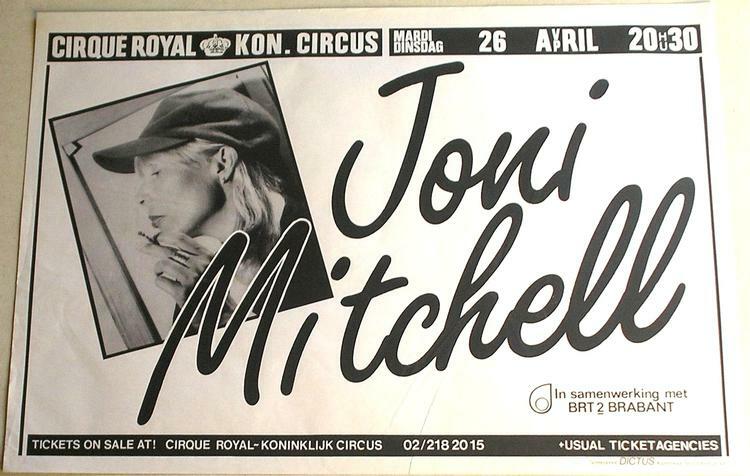 The one and only concert Joni ever gave in Belgium. And I was there, as a young bloke. 'Hejira' was the first album I bought a few years earlier, and I couldn't believe my ears! It is too long ago (more than 25 years) to remember the concert in detail. It must have impressed me, because I kept on listening and buying next albums. I do remember the end of the concert, though. After only one encore, Joni and her band disappeared and the lights in the concert hall went on. Roadies started to dismantle the lights and sound, but the audience did not agree! We kept on clapping our hands, standing up. 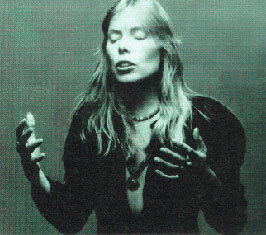 Finally, after 15 minutes or so, Joni reappeared. The only gear left was one piano and one microphone. I forgot what this extra encore was, but it was most impressing. Fortunately, other artists knew after this that the Belgian audience is not satisfied with only one encore when the concert is splendid!